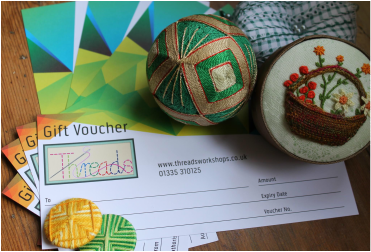 Gift Vouchers are now available for any amount from a minimum of £25 against workshop(s) and/or any accessories purchased on workshops. They are valid for 12 months. If you've enjoyed our workshops, perhaps you have friends or family that may too? A lovely gift for a special occasion. Telephone 01335 310125 or e-mail cathy@threadsworkshops.co.uk if you would like to buy one. Payment will be by BACS direct to our bank account or by cheque. The voucher can be posted to the donor or recipient as desired.